Case Study: Transitioning to ITIL V3 – focus on change mgmt. 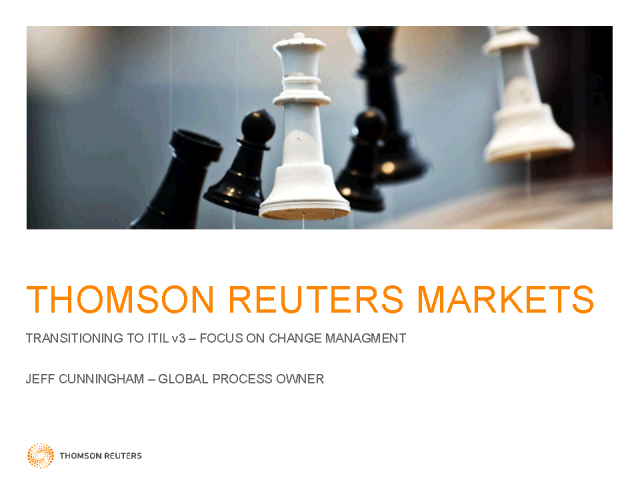 A case study presentation by Thomson Reuters describing the transition from ITIL V2 to ITIL V3. The presentation will focus on challenges and best practices, as well as the way Thomson Reuters has used benchmarks to meaningfully determine cost and ROI. Title: Case Study: Transitioning to ITIL V3 – focus on change mgmt.